How to do a fresh clean install of Windows XP Professional, a Windows XP Professional upgrade, Windows XP Professional install, a Windows XP Professional repair, Windows XP Professional Parallel install, Windows XP Professional OEM installs, Professional reinstall, windows XP Professional compatibility, windows XP Professional requirements, how to Windows XP, and Windows XP Professional uninstall. Windows Messenger lets you instantly communicate with friends and family all around the world from your computer, using text chat and even voice and video. Automatically keep your PC up-to-date with the latest security enhancements including the Windows Security Centre, Windows Firewall, and more to help protect it from viruses and worms that can spread through the Internet. Quickly set up and connect all the computers, printers, devices, and an Internet connection in your Professional with the all new Network Setup Wizard. Sharing a computer with others has never been easier; quickly access your personal files and accounts without having to close applications or restart the computer. 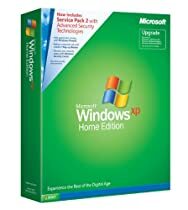 UPGRADE TO VISTA : Before you install or purchase Windows Vista you should make sure that your computer is compatible, click here for hardware and system requirements plus run upgrade advisor that is available from the link provided. This will allow you to checkout your system before you purchase or open the Windows Vista packaging.